Product prices and availability are accurate as of 2019-03-06 00:21:28 EST and are subject to change. Any price and availability information displayed on http://www.amazon.com/ at the time of purchase will apply to the purchase of this product. 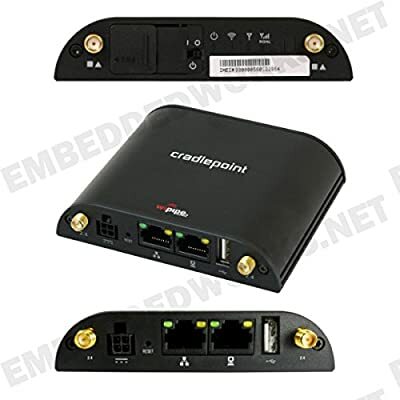 The Cradlepoint COR IBR600B series routers are semi-ruggedized compact M2M routers with embedded, dual-SIM cellular modems with SIM-based auto-carrier selection, wired Gigabit Ethernet for WAN and/or LAN connectivity and 2.4Ghz WiFi. The router features a Category 4 LTE modem with HSPA+ fallback with support for Verizon, AT&T and T-Mobile in the United States. The IBR600B Series is built to provide excellent connectivity for kiosks, surveillance cameras, digital signs, as well as parallel networking and other industrial, retail and M2M applications.